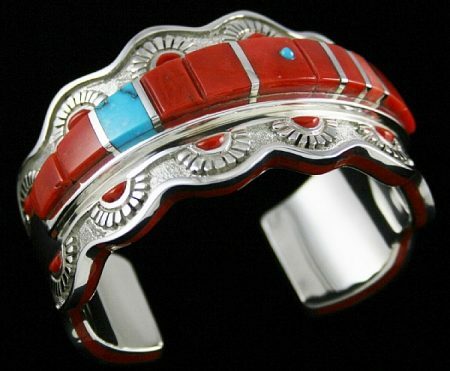 Michael Perry is an outstanding Navajo artist whose jewelry has taken the Native American art world by storm. Born in 1972, Michael creates stunning contemporary jewelry combining overlay, inlay and tufa cast techniques. 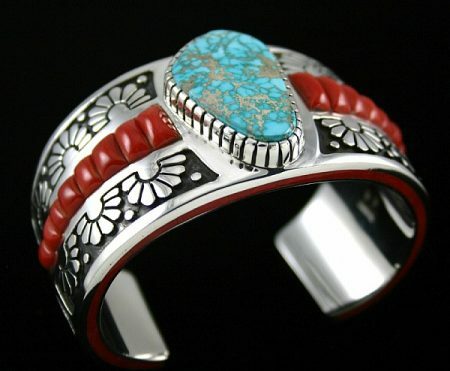 He uses the very finest natural turquoise and the deepest oxblood Mediterranean coral to create his masterpiece bracelets, bolos, buckles and concho belts. His work has won numerous awards. Michael’s parents were silversmiths in the 1970’s. He grew up around a large number of Native American artists who worked with his mother and father. Years later, he picked up his parents tools and began to experiment. Influenced by many of his contemporaries, he developed his own techniques and designs and, several years ago, became serious about creating jewelry. Today, his jewelry can be found in some of the finest Native American jewelry galleries in the world. Navajo jeweler Michael Perry has chosen ten incredible rare gem grade natural Lone Mountain turquoise cabochons to set atop this fine bolo. The gems are deep sky blue with dark choclate brown matrix accents. They sit atop a beautifully hand textured and brightly polished central design surrounded by a complex Navajo rug pattern on the outer edges. The entire circumference of the piece is precision inlaid with deep oxblood red Mediterranean coral. The bolo is held with a heavy ten ply woven bolo cord with unique hand made tips at the ends. 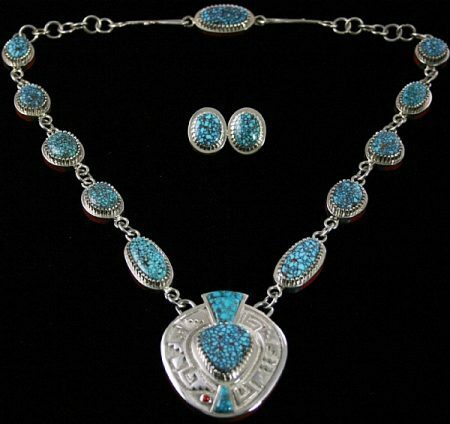 The tips are multi layered and inlaid with Lone Mountain turquoise to match. 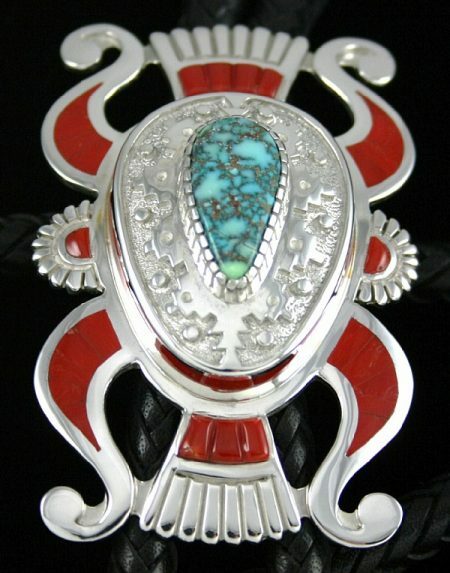 The finished bolo is uniquely one of a kind and highly collectible. Creation of this beautiful bracelet involves the use of overlay, etching, inlay and advanced lapidary skills. 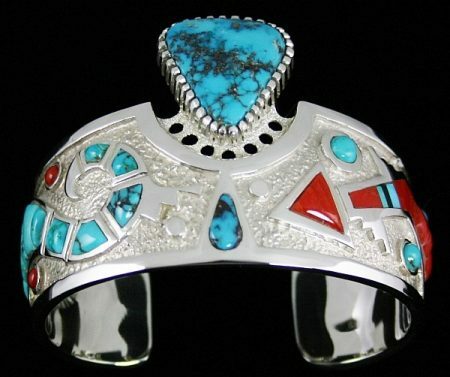 Navajo artist Michael Perry starts with a heavy gauge sterling sheet then overlays a parrot styled design on one side of the shank and a lightning bolt design on the other side. The parrot is finely inlaid bubble style with Morenci turquoise. To each side are small deep red coral rounds. The lightning bolt is flat inlay of gem grade oxblood coral as well with turquoise inserts for effect. To the side are small inlay Morenci rounds. 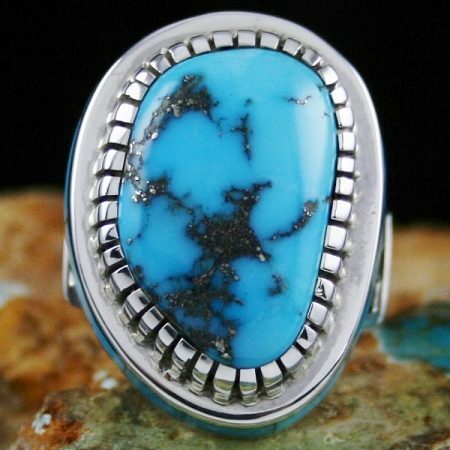 Floated in the center of the piece is a fine gem grade natural Morenci turquoise set in a deeply chiseled bezel. The gem represents the finest quality from the mine and is deep blue with complex black and silver pyrite matrix. A small tear drop of gem grade natural Bisbee turquoise is set flush below the cabochon finishing the piece to perfection. Gem grade Morenci turquoise played out of product in the late 1970s. This stunning natural specimen is deep blue with glistening silver iron pyrite matrix. 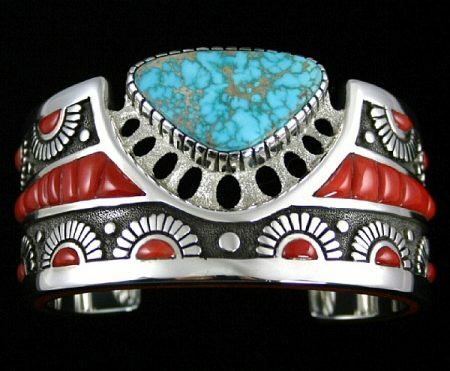 Navajo jeweler Michael Perry has set the cabochon in a fine hand chiseled bezel and surrounded it with perfectly inlaid turquoise from the same mine. The shank is inlaid and overlaid with a rug pattern design for maximum effect. Navajo jeweler Michael Perry is a master of raised and flat inlay techniques in combination with beautiful and unique overlay. 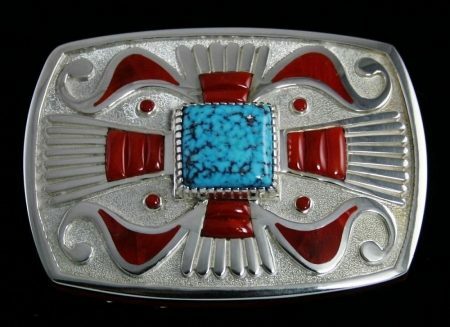 This fine buckle has a ketoh design that is overlaid on heavy gauge sterling silver. The background is finely etched and gem grade natural Mediterranean oxblood coral is inlaid in a gorgeous raised bubble effect. The entire outer edge is also inlaid in red coral to match. 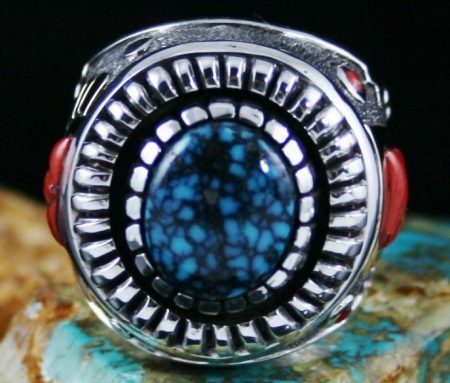 All of these wonderful accents serve to enhance the beautiful electric gem grade natural black web Kingman turquoise cabochon at its center. 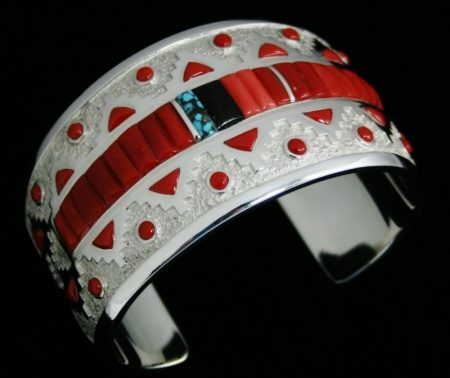 Navajo jeweler Michael Perry has created one of the finest coral bracelets of his career. Each natural gem grade Mediterranean oxblood coral is cut into a thick square and set raised high in the center of the band. Another finely cut square segment is placed next to it across the shank until the entire center of the band is covered. 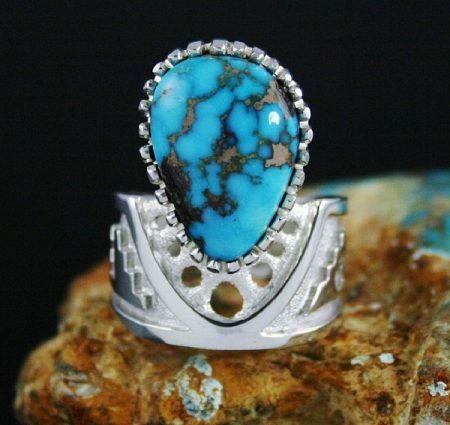 A gorgeous piece of rare gem grade natural Morenci turquoise is added for affect. Whimsically a circular droplet of matching turquoise adorns the coral as well. The shank is then overlaid with circular sunbursts with coral half circles in each design. This magical bracelet is finished with oxblood coral inlay extending the full length of the band on the outer edges of either side. Navajo master jeweler Michael Perry has created one of the finest gem grade spiderweb necklaces of our time. 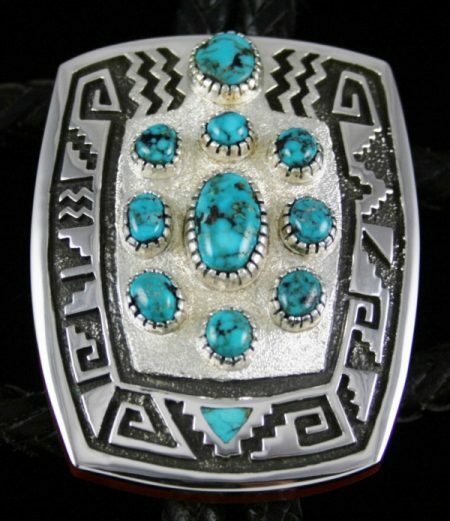 He has picked fourteen natural Kingman cabochons, each characteristic of highest grade of turquoise found from this mine and they are all perfectly matched. Each stone is set in a hand chiseled bezel and inlaid with gem grade Mediterranean oxblood coral around the edges. The gems are connected with hand made chain and are attached to a magnificent pendant. The pendant is set with a gorgeous Kingman cabochon in the center, surrounded with Lone Mountain spiderweb and an overlaid Navajo rug pattern design in sterling silver. The pendant sides are then completely inlaid with Mediterranean oxblood coral. The matching earrings are the perfect compliment to the quality of the necklace, made with tremendous skill and precision as well. 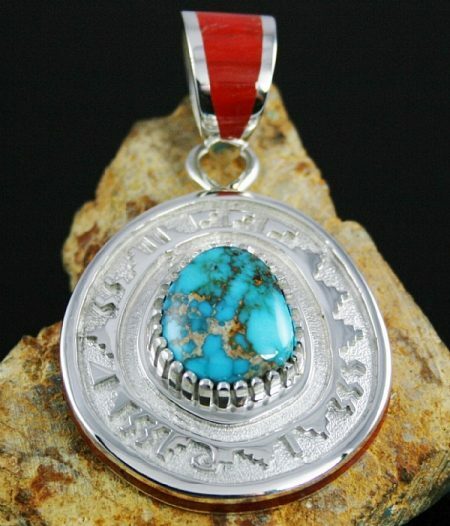 Navajo artist Michael Perry has selected an outstanding rare gem grade Natural Candelaria spiderweb turquoise cabochon to set in this splendid pendant. The gem is sky blue with golden-chocolate-brown matrix. The bezel is hand cut as is the overlaid Navao rug pattern design encircling the stone. The piece is finished by the artist finely inlaying the edges and bale with rare gem grade natural Mediterranean oxblood coral. 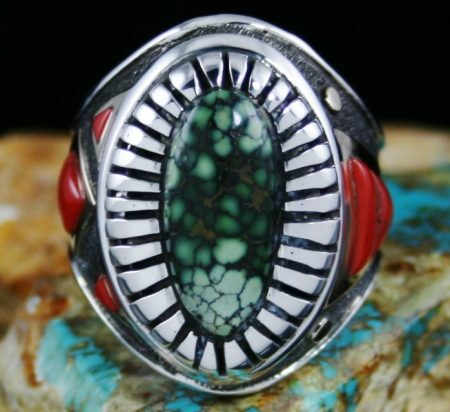 Navajo jeweler Michael Perry has created this unusual and creative ring by selecting an exceptional rare gem grade natural Candelaria spiderweb turquoise to off set in a hand made chisel bezel. The gem is a deep sky blue with golden and chocolate-brown webbing. 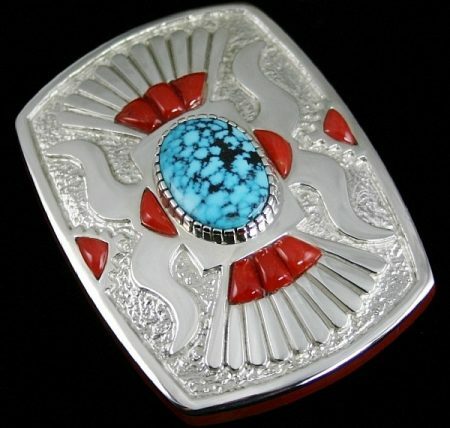 The heavy gauge shank of the ring is overlaid with a Navajo rug pattern design and set to the bezel by a unique fan made of sterling with a granulated finish. 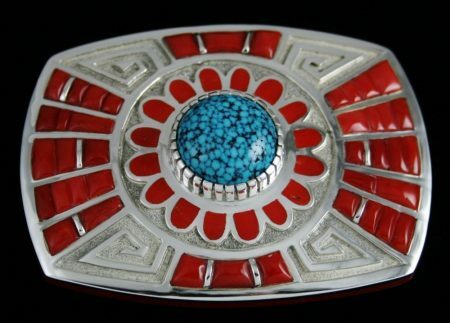 Master Navajo jeweler Michael Perry has created one of the finest bolos imaginable using lapidary and silver smithing skills that reach the peak of jewelry art. The traditional ketoh design has been modified to incorporate raised and flat inlay and a gem grade spiderweb turquoise, adding contemporary elegance to this stunning piece. The rare gem grade natural Mediterranean oxblood coral surrounds the edges of the interior overlay rug pattern design as well as the sides of the piece. Precision cut coral cabochons accent the design within sunbursts. The turquoise is rare gem grade natural Carico Lake spiderweb with a dark blue-green background and chocolate webbing. The sliders and tips are inlayed to match with a wonderful large beaded design at the ends. We have the great privilege of representing Michael Perry with this piece on page 126 of Dr. Gregory Schaff's definitive new book American Indian Jewelry III: M-Z 2,100 Artist Biographies. 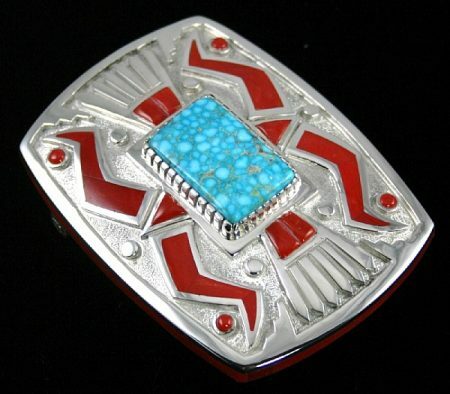 Navajo master overlay artist Michael Perry has created this incredible belt buckle using his expertise in overlay, inlay and modern design. The piece involves overlaying two sheets of heavy gauge sterling silver with such precision that the sides may be inlayed with gem grade natural Mediterranean oxblood coral. A ketoh design is overlaid on the piece and then inlayed with the beautiful stone as well. 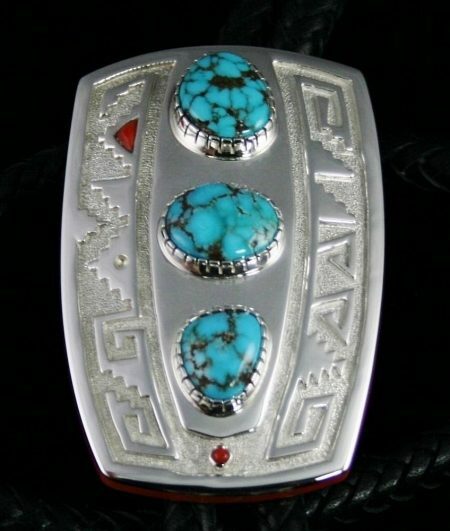 In the center of the piece is a high grade natural waterweb Kingman turquoise perfectly cut into a square shape. The turquoise is sky blue with perfect water webbing throughout. This work is a blend of precision lapidary and silversmithing techniques rarely seen on today's market. 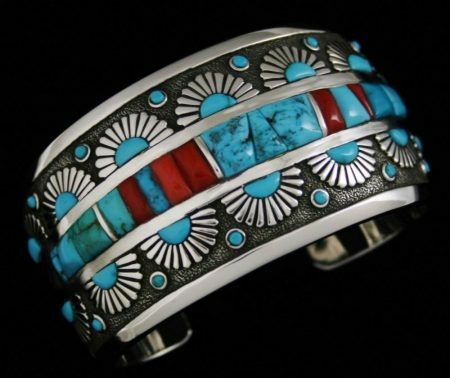 Navajo master jeweler Michael Perry has created this wonderful bracelet by overlaying two sheets of heavy gauge sterling silver. The design is created by precision cutting of the silver into a sunbeam pattern. Sunbursts line the bracelet shank and are made even more beautiful with the darkened background used to accentuate the detail. Using only the finest natural rare gem grade Mediterranean oxblood coral, rays of cornrow inlay pass down the center of the shank with smooth segments featured on the outer edges of the piece as well. The rare gem grade natural Carico Lake spiderweb turquoise is centered in the piece and encircled with a precision hand cut bezel. The gem is sky blue with lovely beige spiderweb matrix with a beautiful and unusual look produced from the mine. We have the great privilege of representing Michael Perry with this piece on page 126 of Dr. Gregory Schaff's definitive new book American Indian Jewelry III: M-Z 2,100 Artist Biographies. 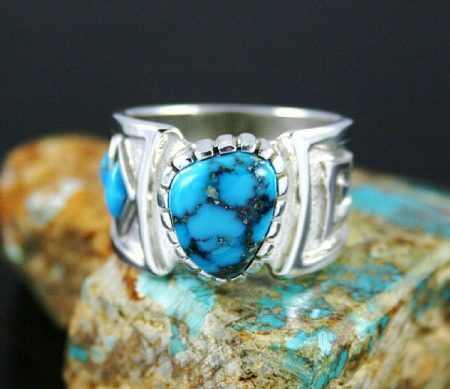 Navajo jeweler Michael Perry has created this beautiful ring by selecting a rare gem grade natural Ithaca Peak turquoise to set in a heavy gauge Navajo rug pattern design. The gem is a deep blue with black webbing and hints of pyrite. On one side of the shank are three diamond shaped segments of rare high grade natural Candelaria turquoise and at the bottom, Candelaria spiderweb with dark brown and tan webbing. Overlay master jeweler Michael Perry has created this exquisite bracelet with gem grade natural coral and turquoise set with unusual lapidary expertise. Fourteen circular segments of oxblood coral are surrounded with incredible sunburst designs flanking each side. The corn row style coral inlay radiates down the center and outer edges of the shank as well. A magnificent rare gem grade natural Carico Lake spiderweb turquoise is floated in a precision cut bezel as the central focus of the piece. This is executed with tremendous skill with each substantial connection heavily textured. The gem exhibits wonderful depth and is sky blue with tan and deep blue spiderweb matrix. The mix of skills on display in the piece are a stunning example of some of the finest work being created in Indian country. We have the great privilege of representing Michael Perry with this piece on page 127 of Dr. Gregory Schaff's definitive new book American Indian Jewelry III: M-Z 2,100 Artist Biographies.